Home ventilation systems use fans to move air into your house, offering an alternative to opening doors and windows. Positive pressure/roof cavity ventilation systems are the most common type available in New Zealand. 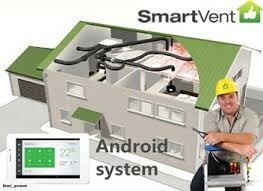 They force filtered air from your roof space into the house through ceiling vents. Most systems have a single fan that forces air through ducting to multiple ceiling vents. If dampness is your main concern, address the source of the moisture problem before looking at ventilation systems. You will often be able to address the source of the moisture yourself without having to invest in an expensive ventilation system. Ventilation systems by themselves are not an effective way to heat your home. If you are trying to make your home warmer, it’s better to invest in insulation and install an effective heating system. Try to make ventilation a part of your daily routine. Here’s a simple checklist for ventilating your home. Air your house a few times a day with wide open doors and windows to create a cross-draught – even in winter. This will quickly replace stale indoor air with fresh outdoor air, and remove moisture from your home. Ventilating your bedroom overnight is also important for a better sleep by maintaining air quality, reducing excessive moisture and the risk of mould growth. Keep a window slightly ajar – a finger’s width should be enough in winter. Use security stays, bolts or latches for your peace of mind. During cold winter nights, use an electric heater on a low thermostat setting in your bedroom. To avoid condensation problems, ventilate when you turn off the heating, for example before you leave the house in the morning and just before you go to bed. Use extractor fans that vent to the outside in your bathroom, kitchen and laundry. Fans should not vent into your ceiling space. Dampness promotes mould and dust mites in our home which can cause respiratory problems. While dehumidifiers and ventilation systems help reduce the symptoms of the problem, they don’t always tackle the cause itself. In many cases, dampness is relatively cheap and easy to fix. Musty smells – in rooms that are closed for any period of time. Damp or mouldy clothes or shoes in wardrobes. Mould forming behind paintings, mirrors and furniture. Mould, stains or watermarks – on ceilings or walls. Rotting wood – in the structure of your house. Musty smells or mould under the house. Condensation on windows – especially in bedrooms – isn’t necessarily a sign of excessive dampness if it only happens occasionally during winter. The average NZ family produces around 8 litres of moisture in the home each day from activities like cooking, showers and breathing. This is normal and can be managed with the right balance of insulation, heating and ventilation. Dampness can also be caused by moisture getting into your house from outside, underneath or through leaky plumbing. These sources of moisture are often hidden and can go undetected for a long time, causing damage to your home. Heat transfer systems take heated air from one room of your house and blow it through ducts into one or more other rooms of your house. The source room must have a heater that can generate enough heat for multiple rooms, such as a large woodburner. Heat transfer systems do not normally bring fresh air into the house and as such are not ventilation systems. However, some ventilation systems may be combined with a heat transfer system.